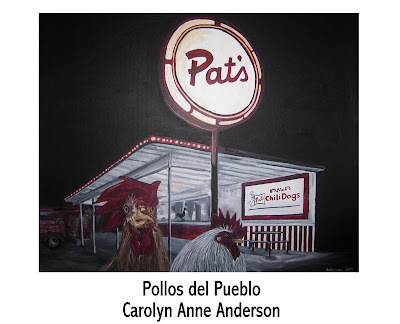 This artists reception will feature paintings by Carolyn Anne Anderson. 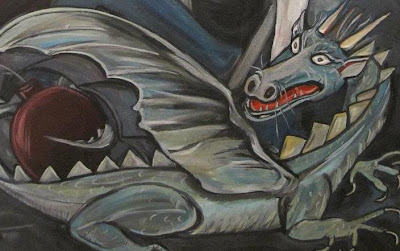 In addition a collaborative installation of sculpture and paintings by Steven Derks and Anderson will be on display entitled "Explosive Mythologies". Within our cultural imagination the arrival of 2012 has been noted by some as the beginning of an apocalyptic era. As we travel further along its linear timeline are we embarking into doomsday scenario, a period of unprecedented social change, or a time rebirth and new beginnings? 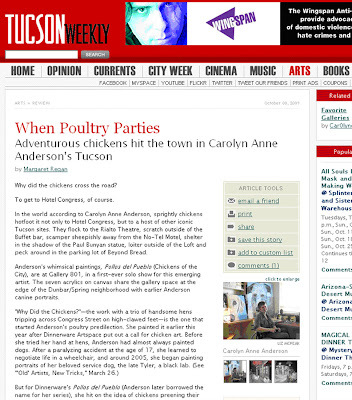 Tucson artists Steven Derks and Carolyn Anne Anderson explore these questions in a cooperative installation entitled "Explosive Mythologies". 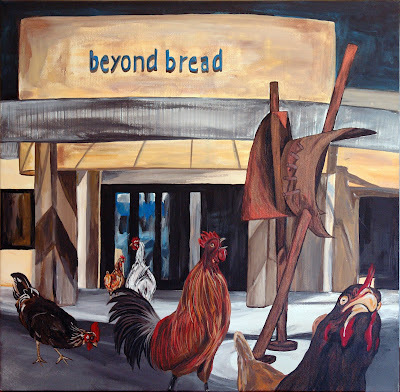 The artists present archetypal symbols, socially constructed images and allegory alongside explosive agents encouraging the viewer to "blow up" their preconceived notions of our reality as we communally enter this new epoch. Combining mediums of sculpture and painting the installation will debut Saturday, March 10 and the project will continue to grow and transform as 2012 enfolds. 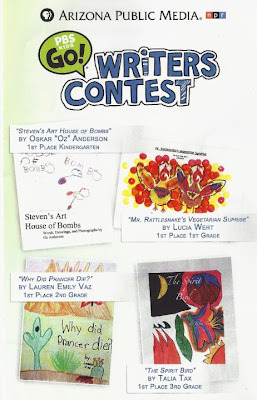 My oldest son Oskar wrote a book for the PBS kids young writers and illustrators contest. He had heard about the contest as they were running "commercials" between his favorite PBS television shows. It caught his attention as one of the winning prizes (at the national level) was a laptop computer. My computer is very old (it's from before I was even born mom!) and I always complain about it. Oz said to me one day- "I am going to enter that contest and win you a new computer so you'll have a fast new one!" The day we went to the Arizona Book Festival we picked up an application form at the PBS booth. That same afternoon was the open studio tour and Oskar came to "work" with me at the gallery. It was the second day of the tour and it was really slow. The gallery was quiet for hours. So Oz got a lot of time to hang out with one of his favorite adults Steven Derks (who owns the gallery where I show my art). The back of the gallery is where all the welding takes place and there is a black smith shop. He loves to watch the guys weld. To sit quietly drawing so that the adults forget he's there and he can eavesdrop on their conversations. He told me he loves the "only grown up" words they use when they are working, even though he knows he's not supposed to say them. I love how he interacts with the art there. Like once he said, come here mom- look at this one! "shhh... its like a secret". He often describes them as sounds, "that one is too loud it hurts my ears!". Oskar brought his camera which has all these fun settings for kids that can distort and twist images. When he filled up his memory card he asked to use my camera. That day he learned to use the "Zoom" feature and spent about an hour photographing things at "macro" close range. He had taken enough photos to also fill my memory card. 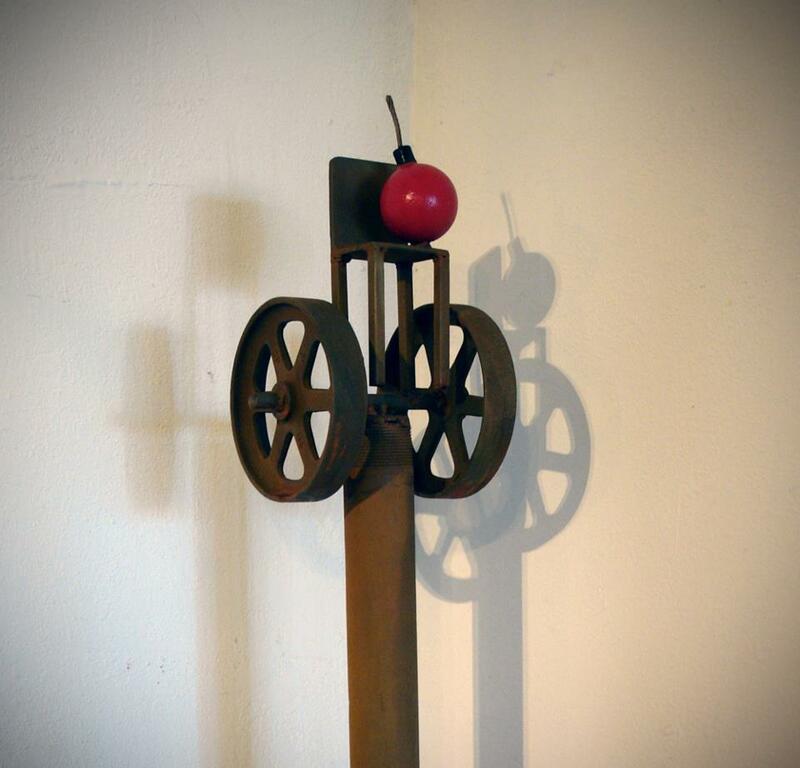 Photos of Steven's sculptures, interesting every day objects, well interesting from a 4 year old's perspective, the other guys working in the back, lots of things. Then he sat with his sketch book and drew pictures of the sculptures- and other things little boys do when they hang out all afternoon at a gallery with their mom. He sat and made up poems about the pieces. His favorite ones are the sculptures that look like cartoon bombs. Afterward Oskar emailed Steven jokes and ideas he has for sculptures and titles. The other sculptures that are Oskar's favorites are the ones he called the "baby doll balloon" sculptures. He often makes reenactments of these ones at home. I will have to post some photos of his version of the baby doll sculptures. What he wrote that day at the gallery and a few emails later became parts of the book along with all his photographs. The next week- we took out the packet and Oz decided to write his book about Steven. I printed out 50 or so of his best photographs so he could pick out what he wanted to use. He set to work. The whole process took him over a month. We worked on it a little bit almost 2-3 days a week for over a month. I have to say I am very proud of him that he finished it. For him the writing was the hardest part- as he was only 4 years old at the time. It's a lot of work for a 4 year old to write a sentence! Then when there is a mistake and he wants to make it perfect and do it again. Some days we just did a sentence. Towards the end we decided that we would type it together. And man, did he put a lot of work into it- and he didn't give up. What I love about the book- and the process- was how it really is sort of a peek into how Oskar's mind works. How I had to really practice staying out of it- and out of his thing, let him decide where he wanted to go with it. Also what it became was a book about a friendship between Oskar and Steven- expressed in a way only a 4 year old could. I could care less about the contest- I love that I have the book. That I have a little window to who he was that day- the weeks- it came together. I hope other parents- contest or not- consider doing a project like this. It was really worth the time and effort. I love how excited Axel was for him "YEAH BRO BRO!"! The Arizona Illustrated Episode will Air Wednesday May 25 at 6:30 on Tucson channel 6. The producers told me they will upload the entire book and it will be available to view online sometime next week on the KUAT COMMUNITY WEBSITE. 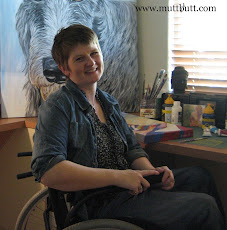 Just a blog entry to shamelessly ask for a vote for a contest. Click Here To See The Contest. Mutt Lynch Winery (the wonderful folks who donated all the wine for the Wiemaraner Rescue show we did last year) is having their annual Wine Bottle Label Design contest. My submission is the painting of Tyler running into the woods (seen above). if you want to consider voting for it. 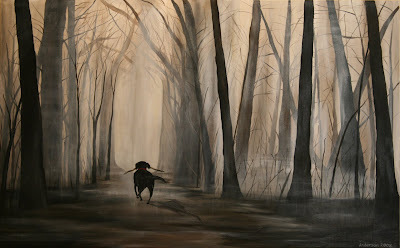 Also- as I know LOTS of you on the blog list are dog lovers- click over and check out all the beautiful dog art! 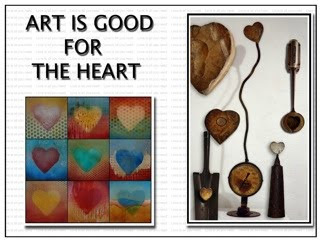 There are lots of talented artists who are participating- some of the pieces are amazing! The host of the contest is "Dog Art Today" and there are lots of links to dog artists and interesting stuff to read on the blog. You can also just CLICK HERE and vote for #8 directly if you so desire. If you enjoy wine- check out Mutt Lynch Wines- they do a lot to support many dog charities and events. 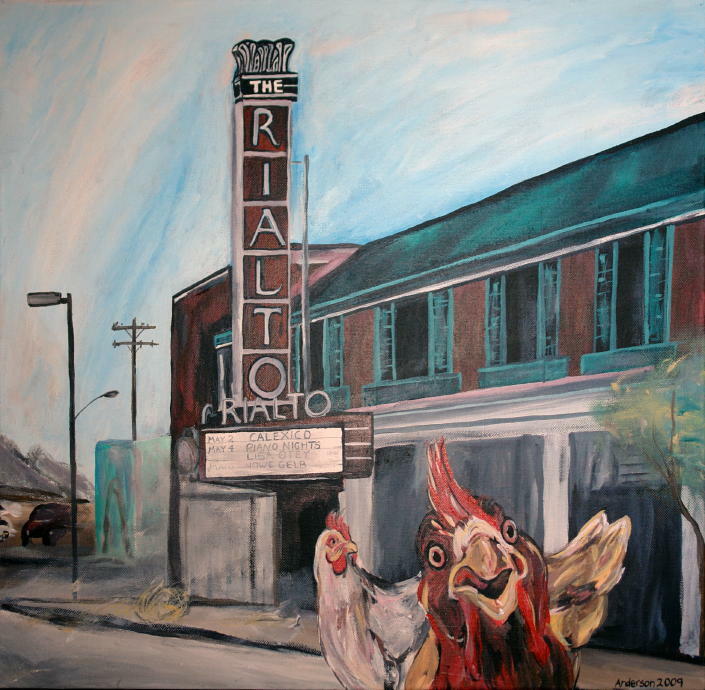 Chickens at Sabino Canyon 12 x12"
The Bay Horse Tavern 12 x 20"
As of March 2010 I have Glicee' available of some paintings. 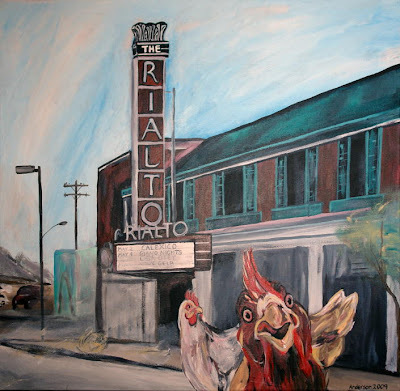 Glicee are precise reproductions rendered on stretched on canvas through ArtsEye/Photographic Works in Tucson. Please email Carolyn AT Muttbutt.com if you are interested. 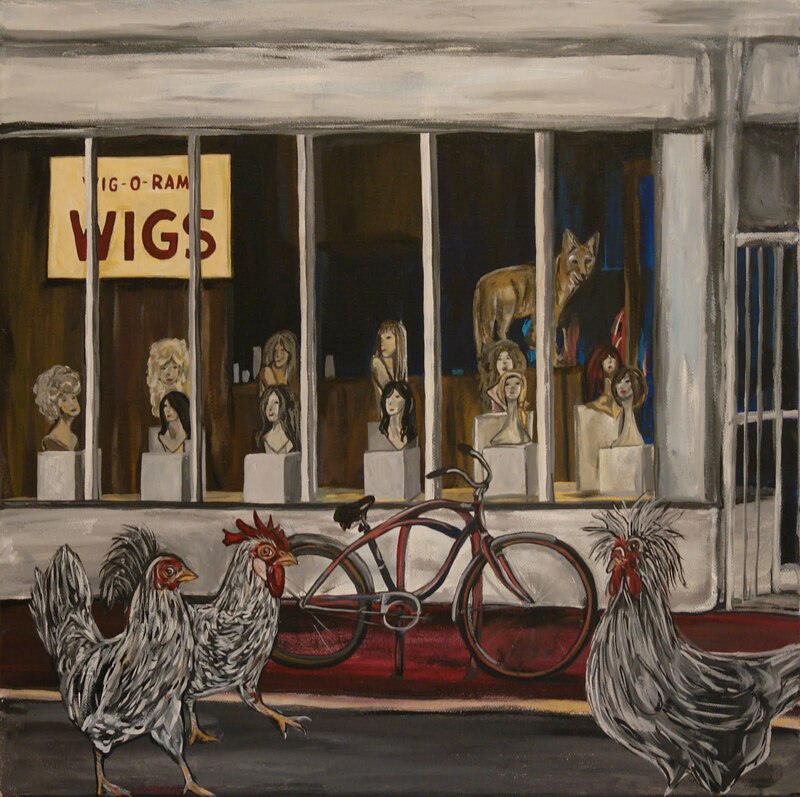 Prices vary by size but are approximately 1/3 the cost of the original painting. Please visit Photographic Works' website for more information on the glicee process. Arts Eye is a local Tucson business that specializes in glicee reproduction and is an industry leader in the field. I have been very happy with the glicee reproductions they have made of my work and I have a couple samples I can show if you if you are interested in a purchasing glicee. Currently I have Glicee availabe for three paintings. With a 3-4 week waiting period I can produce a glicee on some available work. Please contact me if you are interested in a glicee of a specific piece not shown below. The glicee can be produced larger or smaller with a variation in cost. The prices above reflect glicees produced on stretched canvas. The cost is less for glicee on paper/canvas. These are digitally rendered prints, photographic archival quality, printed on Moab Photo Rag paper. 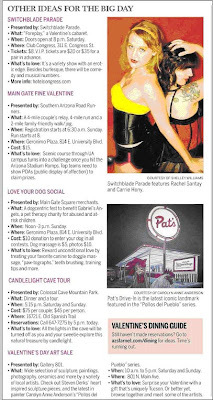 Check Out the Mention in Today's Arizona Daily Star! 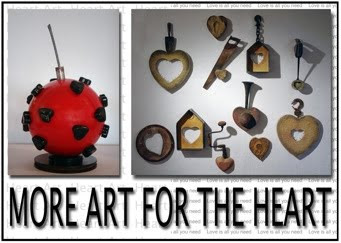 Stop by Gallery 801 this weekend for our Valentine's Day Event! Lots More! Hope to see you there. 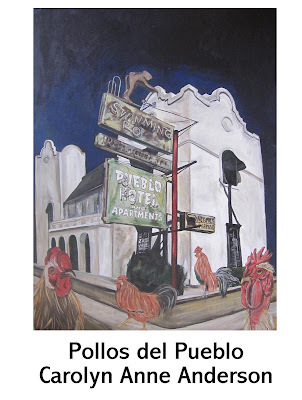 Margaret Regan of the Tucson Weekly reviews my solo show and the series of paintings called "Pollos del Pueblo".